It is a source of some amusement to my friends and family, and the cause of more than a little amazement on my part as well, that I cry – I mean, sob! – at exactly the same scene every time I watch IT’S A WONDERFUL LIFE. And I have seen this film more than any other. I have to see it each Christmas, and often a time or two in-between. Jimmy Stewart is charming. I adore him unreservedly. Lionel Barrymore’s eyebrows should have been nominated. All the acting is a bit over the top. The story telling is at the very least old fashioned. The special effects are, at times, laughable. But there is something in this well-worn favorite that touches me like few others movies ever have and I can’t imagine another film that could do it on cue every single time I see it. In fact, just remembering or trying to repeat the line that does me in every time I hear it on screen can often bring on the waterworks all by itself. 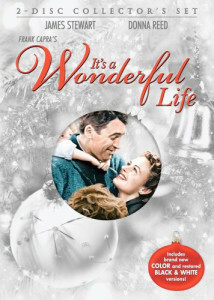 IT’S A WONDERFUL LIFE is a must for the holidays, but it’s a favorite of mine every day of the year because every viewing reminds me just what it is that’s so wonderful about life.